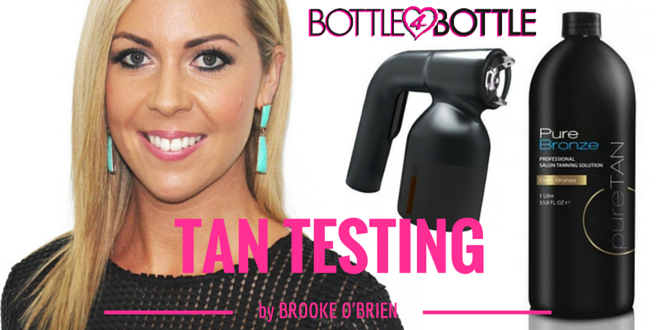 TAN TEST by Brooke O’Brien – PureTAN PureBronze Dark Bronze | [All Things Tanning] For Tan Fans! A Salon Tan is now in your hands. PureTAN’s PureBronze Professional Range offers deep hydration and long lasting colour! PureTAN’s PureBronze Professional Salon Range is Rich in Antioxidant ingredients to assist and fight the signs of aging, including Vitamin C & E and Kakadu Plum Extract. PureBronze Provides Intense Hydration through nourishing agents including Organic Macadamia Oil + Coconut Oil assisting a longer lasting and even fade tan. Contains Firming + Toning technology – Caffeine, and Soothing Skin agents Aloe Vera + Green Tea. This is no ordinary tan test, I am very excited to share this one with you! I spray tanned my model Laura the day before she excitingly jet set over to beautiful Bali for a holiday. Of course Laura wasn’t going to have her mind on maintaining her spray tan correctly. Laura’s plan was to explore the island, swim, take in the tropical sun rays and drink cocktails at sundown. When spray tanning PureTAN’s Dark Bronze I was impressed in how smooth it sat on Laura’s fair skin. The solution came out of my spray gun in a fine mist and the colour guide was visible to achieve an even application. What I love about PureTAN’s professional spray tan solutions is the nourishing skin care properties; Vitamins C & E, Organic Macadamia Oil, Coconut Oil, Aloe Vera & Green Tea. All these natural ingredients is to assist in a longer lasting tan and give nourishment to the skin. Laura found that the tan was non-sticky and fast drying, giving her the confidence to get dressed almost straight after her application. Ok the part you have all been waiting for… How long did Laura’s spray tan last? Surprisingly Laura’s tan lasted for 6 days and didn’t go patchy. Laura is the typical “girl next door” personality. Laura loves to workout at the gym 3 times a week and works part time at a fashion store. She spends weekends going out with friends and takes the time out for her regular beauty routine. Laura is not a outdoor tanner and has naturally pale skin all year round, this is why Laura is the perfect spray tan model to show everyone at home and salon professionals the true colouring in which a spray tan can give you. A pale skin tone will highlight the spray tan’s true hue of colour – natural or orange, dark, medium or light tan. There are so many spray tan solutions out there on the market and it’s hard to choose the right one to suit you or your clients! Each month Brooke O’Brien from Bottle 4 Bottle and All Things Tanning have partnered together to take you on a Spray Tan journey showing you before and after pictures of what different spray tan brands and solutions look like on Model Laura.